Recently in the Wrapunzel inbox, someone wrote to us with a conundrum: she had this beautiful dress, in a striking black-and-white floral pattern. But she never liked the look of either black or white tichels by her face. What else could she wear that would work with the dress? I love this question, because it’s relevant to so many people. Lots of us like the look of a formal black dress, or a crisp white shirt under a black blazer, or a sassy stripy skirt. Unfortunately, many ladies (including me!) 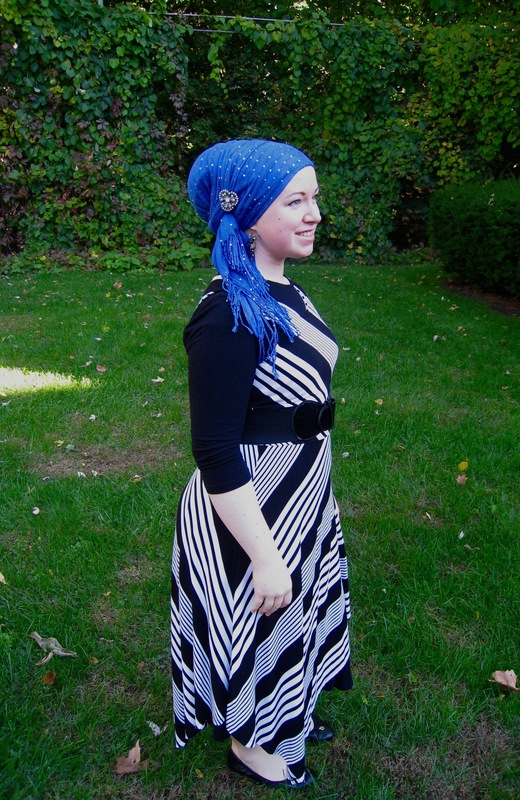 find that wearing a pure black or white (or black-and-white) tichel can feel a little harsh next to their skin tone. Thankfully, there are some really good solutions! These are my favorites. I’ll demonstrate with my new stripy dress, and I’ve asked permission of a few other Wrapunzelistas to share their pics, too! Any bright pastel or deep jewel tone is a win with black-and-white. Ruby, teal, royal blue, purple, or emerald green are good jewel tones. If you look good in pastels, try a robin’s-egg-blue, bubble-gum pink, sherbert orange… you get the idea! Pick your favorite richly-colored scarf, add some sparkles, and you’re all set! Silver, bronze, or gold go with just about everything, and black-and-white is no exception. If you’re not feeling like a bright pop of color, a shiny silver might give you just the perfect solution! If you don’t like the look of black or white by your face, you can use a flattering color as a base scarf, let some of it show right by your face, and work your black/white magic over top of that! And Wrapunzelista Shira adds a little white (or black-and-white!) to turquoise for a stunning effect! Do you have a favorite wrap to wear with your blacks and whites? 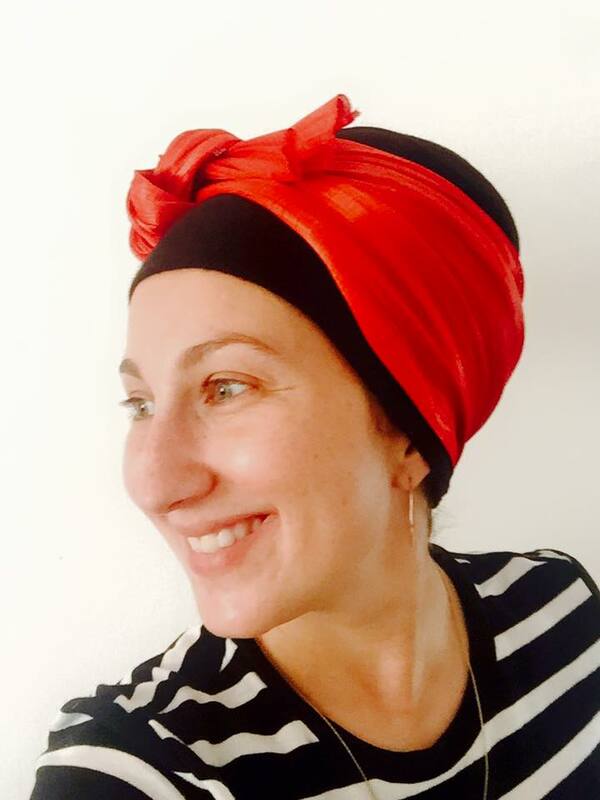 What tichel makes you feel fabulous when you pair it with your little black dress or suit? How about wrapping styles – tails or no tails? Share with us in the comments!! How did Shira do the wrap in the second picture, where it sort of twists down the one side??? ?